Authorities and the company whose Houston-area petrochemicals terminal continues to burn say reviews of the air quality around the facility show it is not dangerous to individuals. Harris County Judge Lina Hidalgo said Monday officials continue monitoring air quality levels following the fire at Intercontinental Terminals Company in Deer Park, about 15 miles (24 kilometers) southeast of Houston. ITC spokeswoman Alice Richardson says a report done by an environmental consultant hired by the company shows the air quality was below levels that would represent a health risk. Fire crews continue to battle the blaze, which began on Sunday. Officials say the fire will burn another two days. Officials say a large fire at petrochemicals terminal near Houston will likely burn for another two days. The fire erupted Sunday at Intercontinental Terminals Company in Deer Park, about 15 miles southeast of Houston. Fire crews continued battle the blaze Monday, and authorities monitoring air quality around the facility say levels are within normal guidelines. ITC says the risk of explosion at its facility is “minimal” and no injuries have been reported. The company initially said the fire had spread to eight storage tanks. But on Monday, the company said the fire had spread to seven tanks and that one of the tanks was empty. The tanks contain gasoline components. Officials say fire crews are using foam to battle the blaze and to protect the surrounding storage tanks that have not caught on fire. 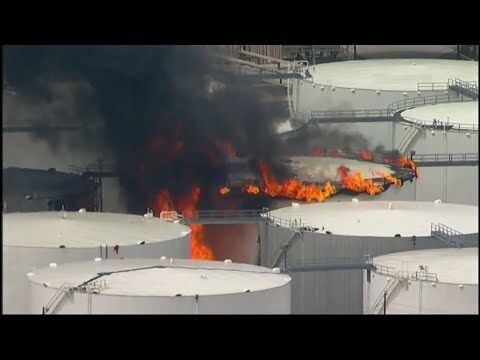 Emergency crews in Texas are working to control a large fire burning at a Houston-area petrochemicals terminal that has spread to eight storage tanks. The fire started Sunday morning at Intercontinental Terminals Company in Deer Park, about 15 miles (24 kilometers) southeast of Houston. ITC says the risk of explosion is “minimal” and no injuries have been reported. The company said Monday morning that the fire has spread to a tank that contains a chemical used in nail polish remover, glues and paint thinner. Earlier, the fire spread to separate tanks that contained petrochemical liquids and gases, including fuel oil and bunker oil. Early Monday, Deer Park lifted its shelter-in-place order for residents but school was canceled Monday in the city.